You are currently browsing the The Pet Product Guru blog archives for the day Friday, January 18th, 2019. Does your dog love to ride in the car? His head is stuck out the window and he loves the breeze and all of the things that he smells. What could be the harm in this? Eye injuries that’s what so many vets hate to see. Think of all of the things that go splat on your window and you can imagine how many potentially harmful things could get into your dog’s eyes. There is a compromise. Roll down your window just enough for the dog’s nose. Those great smells will still be there. All that’s missing is the risk to your dog’s vision. Don’t forget to buckle your dog up. 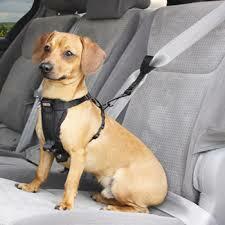 A properly fitted seat belt harness will keep your dog in place and from harm when you make that sharp turn. The best oldies are playing right now on Edgewater Gold Radio! The best variety of great music from the 50s through the 80’s to keep your company all day and night long. Download the free Edgewater Gold Radio app or listen from our website: Edgewatergoldradio.com.